During the past school year, hundreds of high school journalists throughout the country worked hours to complete their portfolios for state Journalist of the Year contests, and the 33 state winners who entered the national competition were recognized April 17 at the closing awards ceremony of the JEA/NSPA Spring National High School Journalism Convention in Los Angeles. 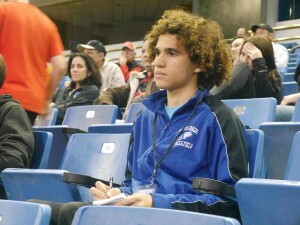 Kellen Browning of Davis (California) Senior High School was named the 2016 National High School Journalist of the Year. 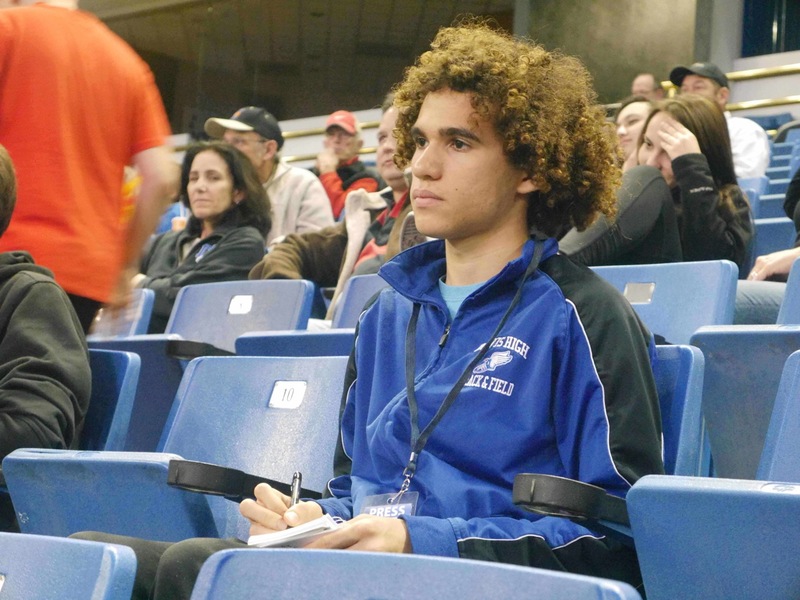 When the final results were announced, Kellen Browning of Davis (California) Senior High School, was named the 2016 National High School Journalist of the Year. Browning will receive a $3,000 Sister Rita Jeanne Abicht Scholarship as part of his recognition from the Journalism Education Association. Will Clark, St. Mark’s School of Texas, Dallas, Texas (Ray Westbrook, adviser). Katie Pickrell, Mountain Vista High School, Highlands Ranch, Colorado (Mark Newton, MJE, adviser). Justin Curto, Mill Valley High School, Shawnee, Kansas (Kathy Habiger, MJE, adviser). Tyler Arden, Reno (Nevada) High School (Christy Briggs, MJE, adviser). Anna Laffrey, East Grand Rapids (Michigan) High School (Katie Michel, adviser). Named in honor of JEA’s longtime treasurer, the late Sister Rita Jeanne Abicht, FSPA, the scholarships recognize some of the top high school journalists in the country. Portfolios are judged in the month leading up to the JEA/NSPA spring national convention, and scholarship funds are paid directly to the recipients in honor of their work on scholastic media. The national applications this year were again submitted digitally. The competition attracted dozens of entries in some states and none in others. The 40 members of the scholarship committee were impressed with the depth of experience contained in the state-winning entries. Browning has been a member of his high school journalism program for three years, most recently as editor-in-chief of the Blue Devil Hub, Davis High School’s online newspaper. In addition to being an editor, Browning continued to write stories that matter to his community. He wrote an investigative piece that forced district administrators to re-evaluate their budget. Browning gets involved in what he is covering and feels as though he becomes part of the story himself. Although writing is his forté, he worked to expand his skills, and learned more about photography, video and broadcast. As a leader of his staff, Browning wrote that he feels he is shepherding young journalists, leading the way. Will Clark of Texas captivated the committee with his essay. His inner desire to give a voice to the voiceless is obvious in the gritty stories he has covered. He covers topics that mean something to his community, and packages them with creativity through design and photography. Katie Pickrell of Colorado thrives off of helping others, and considers her position a full-time job. In her own words, she feels journalism has become a way of life. As she started high school, she felt little motivation to rise. Her adviser, Mark Newton, MJE, shared with the judges, that as soon as Pickrell found journalism, it became her place to thrive. “It is clear that it is her life’s mission to educate her audience, to speak loudly and clearly for those who don’t have the ability or access or talent to do so as effectively as she can,” said committee member Ava Butzu, and adviser at Grand Blanc (Michigan) High School. Justin Curto of Kansas is a 21st-century journalist with experience in all media. Matthew Casler of Florida is an innovator as well as a leader and journalist. The judges picked up tips from him to apply in their own media programs. Tyler Arden of Nevada pounded the pavement for stories and went directly to hard-to-get sources. He had a rapport with his district administration and used professionalism to cover controversial topics. Anna Laffrey of Michigan has presented at a TEDx Event, which is affiliated with the organization famous for TED Talks. Her adviser, Katie Michel, feels she is empowered with her job as editor-in-chief of their newspaper. The Journalism Education is a national organization of scholastic journalism teachers and school media advisers. Its headquarters is at the A.Q. Miller School of Journalism and Mass Communications at Kansas State University, Manhattan, Kansas. For more information about the JEA or its National High School Journalist of the Year program, please go to www.jea.org or call 785-532-5532.